In 1989 an idea was hatched. Why not a wrecking yard dedicated to vintage cars? In 1989, think about it, a ’69 Chevrolet/Ford/Mopar was 20 years old. Who was looking for these cars? Todd Toedtli was. What IF he gathered cast off projects and created a salvage yard where one could find window cranks for a ’62 Impala? 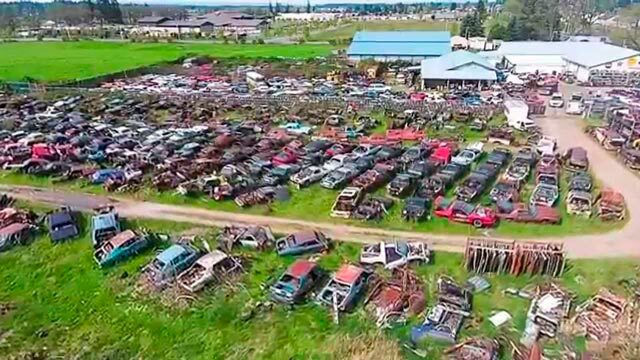 What if, when dealerships sent piles of NOS mouldings to a salvage yard that were left for scrap, he could document the pieces and then resell them? What if he plowed the unused portion of the defunct dairy farm, lay down some rows of gravel, and then organize row by row of vintage tin? What if, with every car that was purchased or donated to the yard, a spreadsheet was created and then every part inventoried? “What if” became “He did”, and All American Classics was born. The yard started as a five acre lot, expanded, and eventually grew to as large as 20 acres at one point in time. Name the car; it’s crossed the gates, but Todd has a penchant for GM and, especially, Camaros and Impalas. “You know, some of these Camaros were actually driven into the yard,” Todd says. One can see what are the remains of the many ’67-’69 Camaros and Firebirds, and they’re stunning. From muscle cars to luxury cars. Hardtops to station wagons and convertibles. Pick up trucks, too. Currently at the yard, there are no longer any mid to late ’50’s Chevrolet or GMC trucks. Heck, even the early Ford trucks are hard to find. But, they’re always looking! In the yard’s ever changing landscape, there are still a handful of 1947-1954 Chevrolet/GMC trucks as well as two Suburbans, a few 1960-1966 Chevy trucks, one 1959 Ford F-100, and a 1966 Ford F-250. A few 1967-1972 Chevy and GMC trucks round out the offerings. But, of course, trucks aren’t all you’ll find at AAC. “We tried to stock newer cars and trucks; even some imports, but as of January this past year, I have decided to go back to where it all began.” says Todd. “We will have some stock of new vehicles. Camaros and Corvettes of course. Some Mustangs. But, I really love being a yard where time has stood still. Come on down and wander. It doesn’t cost anything, and who knows, you may find that missing part.” Todd adds. Speaking of missing parts, take a look at your own current project. Impala. Galaxie. Newport. Camaro. Mustang, Cutlass, Skylark, Chevelle, Nova, Falcon. We’re sure you’ve realized that the pickings are slim, my friends. The aftermarket fenders and such are VERY affordable, but from what we have seen, lack in quality and applicatiion. Most of the parts are made offshore from dies that were purchased from the manfacturer but, even then, have been used beyond their time. Chrome plating on that $100 ’67 Camaro bumper from a supplier simply doesn’t have the same as an OEM piece, and the fit is not as good as an original OEM core. We’ve seen it. And, be it a frame for a ’65 Cadillac or a set of lower control arms for a Nova, each used part is inspected before the customer even touches it. In fact, when the folks at AAC quote you a price, you can be assured it’s a part that Todd has personally inspected. You don’t have to be a local to shop, either. At All American Classics they aim to please. Parts can be picked up locally, or they’ll ship them to you. They even ship internationally. At the present time, the yard is down to five acres. We know, we know, we can hear all of the yelling and such, but let’s take that into perspective. Some of the cars at AAC had been there since 1989. That’s almost 30 years. 30 years of parts pulled, rain, frost, and freezing. Years of customers forgetting to close a door. Vandals breaking rear windows. Inner door panels, dash pads, and bucket seats pulled from cars. 30 years of many different hands pulling parts like taffy. We’re all human; mistakes happen. “It seemed like a good idea at the time!” Todd laughs and looks over his shoulder as Pat, the yard supervisor, brings up a fully stripped ’72 Cutlass sedan for inspection. Todd pauses then says, “I’ll probably be crucified for that one, too.” A fully stripped 4-door sedan is now headed to the crusher. But the cars are still out there. In the last two weeks alone, AAC has purchased two vintage cars. One a 1939 Buick 4-door sedan that had been garaged since 1961. It will be sold as a project. The other car is a 1962 Impala SS convertible. It’s in need of a full restoration, but what a find! So, if you heard rumors that All American was closing their doors for good, never fear. They’re still here. They continue to maintain a footprint, have 800 cars ready to be parted out, and still have project cars ready to be purchased and taken home.